An Opera in Baghdad is a long poem, published in Minhinnicks recent New Selected Poems (Carcanet). It concerns a visit he made to Iraq in 1997, between the first and second Gulf Wars. This opera is a lively and very musical dramatic poem, says Robert Minhinnick. It commemorates some of the extraordinary people I met on the visit. Entering and leaving Iraq meant arduous journeys across implacable desert. The experience has had a major effect on my writing, especially the visit to a deserted Babylon. I was helping make a film about uranium, and hope scenes might be screened during the performances. Friday, April 5, 2013, 8pm. Thursday, April 11, 2013, 7.30pm. 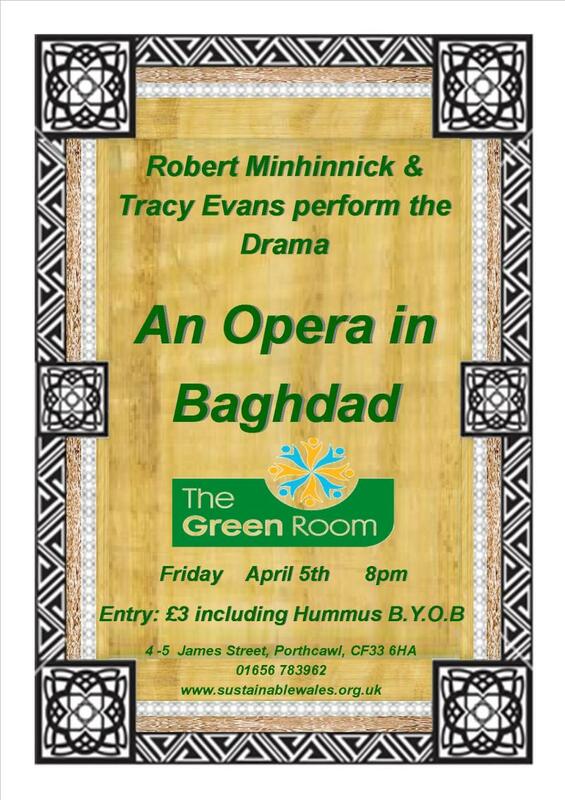 Robert Minhinnick & Tracy Evans perform An Opera in Baghdad, Dylan Thomas Centre, Swansea SA1 1RR Details 01792 463980. This entry was posted in Uncategorized on March 18, 2013 by Bridgend's Green Leftie.